Smoke has been used by to flavor food by people around the world. Here's the Thai way to use smoke, always to prepare desserts. Anyone not familiar with fragrant desserts made using this herbal smoke candle, is in for a wonderful surprise. We love the unique aroma, like nothing you've ever tasted. To make this candle, spices and bees wax are slowly heated & mixed together, then rolled into a long thin ribbon, and hand-wrapped around the thick cotton wick. This is an all-natural product. There is nothing quite like the delicious flavor of Thai fragrant cookies, which are made with a simple recipe then flavored with this herbal candle that emits a heavy fragrant smoke. Our new recipe uses the fragrant candle to scent coconut milk: Tapioca Pearl and Cantaloupe with Fragrant Coconut Cream. One candle lasts for a long time (many batches) because each time you use it, only a bit of the wax is burned. Keep in ziplock for longterm preservation of the aroma. 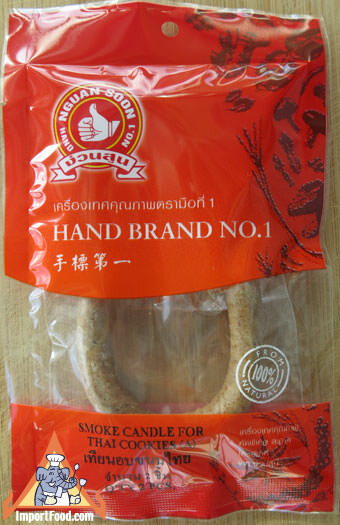 Contains two individually-packaged smoke candles. Smoke has been used by to flavor food by people around the world. Here's the Thai way to use smoke, to scent coconut milk and simple syrup that's served over fresh fruit and tapioca pearl. The candle is made with fragrant spices and bees wax, rolled into a ribbon, hand-wrapped around the thick cotton wick. Anyone not familiar with fragrant desserts made using this herbal smoke candle, is in for a wonderful surprise. We love the unique aroma, aromatic coconut milk and fresh fruit is like nothing you've ever tasted. So healthy, earthy and fresh, you won't want to stop eating. You might also be interested in our Recipe for Thai Cookies which uses the same fragrant candle.